Metaphors Be With You Graphic Tee for Just $4.99! You are here: Home / Great Deals / Metaphors Be With You Graphic Tee Just $4.99! 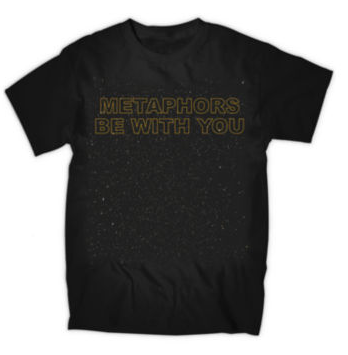 Metaphors Be With You Graphic Tee Just $4.99! Star Wars and Grammar Fans Unite! Head over to JCPenney to get this Metaphors Be With You Graphic Tee for Just $4.99! Feel the power of the farce in this comfortable cotton tee, designed and printed not very long ago in a galaxy not far away.